Toronto, Ontario--(Newsfile Corp. - August 21, 2018) - Pancontinental Resources Corporation (TSXV: PUC) ("Pancon" or the "Company") announced today that initial prospecting and mobile metal ion (MMI) soil sampling programs on its Nova Project confirmed the presence of cobalt mineralization as well as significant MMI cobalt and gold anomalies. Layton Croft, President and CEO of the Company stated: "We are pleased with the results from our initial surface exploration work at Nova, including results from a series of MMI soil pathfinder elements. Rock sampling confirmed the presence of cobalt mineralization. Our independent MMI analysis identified a broad cobalt anomaly in the northeast sector of the survey area, coincident with electromagnetics (EM) and a strong magnetic anomaly, forming a bullseye target. The MMI soil data also showed a significant and unexpected gold anomaly stretching over 200 metres in a northeast-southwest direction and open to the southwest. 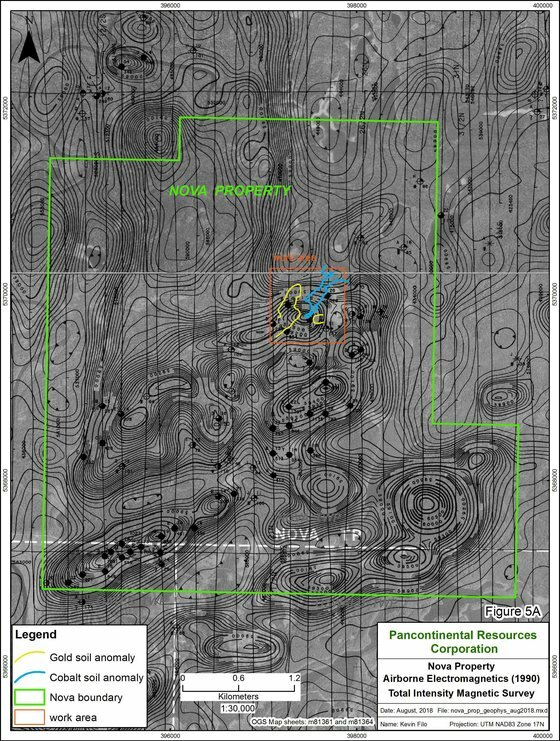 Based on these surprisingly positive initial surface exploration results, the Company recently staked additional claims and the Nova Project now encompasses 2,080 hectares." Sampling of a second trenched area, with massive sulphides, returned 120 ppm cobalt and 138 ppm cobalt in the northeast sector of the survey area. This trench is associated with a broad cobalt MMI soil anomaly on the flank of a strong bullseye magnetic response with untested electromagnetic conductors. MMI soil sampling also located a very significant gold anomaly stretching more than 200 metres in a north-northeasterly direction; this anomaly remains open to the southwest. Anomalous MMI copper responses correspond, to a limited extent, with the elevated MMI gold responses. Weak anomalous gold and zinc values were also identified in bedrock occurrences hosted within felsic rocks proximal to the MMI gold and copper soil anomalies. This environment suggests potential for a polymetallic volcanogenic massive sulphide deposition. All targets of interest to date are associated with a bullseye magnetic anomaly located within a larger, complex, folded magnetic anomaly stretching across the entire property. Within this larger magnetic anomaly there is a series of smaller bullseye magnetic targets with coincident EM anomalies which are untested; these areas represent prospective targets similar to where the new gold and base metal targets were detected. In addition, the Company has renamed its Montcalm West Project and the three properties it contains. The Montcalm Project, formerly called the Montcalm Property, covers 3,780 hectares of the Montcalm Gabbro Complex in the Montcalm Greenstone Belt, and is adjacent to Glencore's former Montcalm Mine, which previously mined 3.9 million tonnes of Ni-Co-Cu ore and produced more than 4 million pounds of cobalt (Ontario Geological Survey, Atkinson, 2011). The Gambler Project, formerly called the Gambler Property, is adjacent to the Montcalm Project and covers 7,620 hectares of the Montcalm Gabbro Complex in the Montcalm Greenstone Belt. The Nova Project, formerly the Nova Property, covers 2,080 hectares and is located 19 kilometres southwest of the Montcalm Project. As a result, the Company will no longer refer to the "Montcalm West Project," per se. To view the Nova Project Map and the initial work area, click here. The Nova Project (2,080 hectares) is one of three Pancon projects in the Montcalm Greenstone Belt. Nova is located 19 kilometres southwest of Glencore's former Montcalm Mine, which previously mined 3.9 million tonnes of Ni-Co-Cu ore and produced more than 4 million pounds of cobalt (Ontario Geological Survey, Atkinson, 2011). Regionally, the Nova Project covers a portion of the eastern boundary of a major regional structure known as the Kapuskasing High (also known as the Kap High). Very little exploration has been conducted on this structure until recently, leading up to Goldcorp's recent announcement of plans to develop its Borden Lake Gold Mine, located in the Kap High. The technical information in this news release has been prepared in accordance with Canadian regulatory requirements as set out in NI 43-101 and reviewed and approved by J. Kevin Filo, PGeo, a Qualified Person as defined by NI 43-101, a member of Pancon's Technical Advisory Committee, and Pancon's Project Manager for the Montcalm, Nova and Gambler projects within the Montcalm Greenstone Belt. Assaying of samples was completed at an Actlabs facilities in Timmins, Ontario. Rock grab samples were analyzed for gold using Actlabs standard fire assay procedure 1A2 and silver and base metal analysis completed using Actlabs ICP procedure 1E3. In addition to Actlabs QA/QC blanks and standards, a series of separate standards, blanks and duplicate samples were submitted by Pancon for internal QA/QC. Further details on the Actlabs procedures can be reviewed on their web site ( www.actlabs.com). Pancontinental Resources Corporation (TSXV: PUC) is a Canadian-based mining company focused on exploring and developing 4 nickel-cobalt-copper projects in Ontario — the advanced stage McBride Project near Bancroft and three early stage projects near Timmins: Montcalm Project, Gambler Project, and Nova Project. Pancon's strategy is to create value from prospective assets in low-risk areas with existing resources and/or in proximity to producing or former mines. The Company also holds a 100% interest in the Jefferson Gold Project in South Carolina, USA. In 2015, Pancon sold its interest in its Australian rare earth element (REE) and uranium properties, formerly held through a joint venture, and retains a 1% gross overriding royalty on 100% of future REE production. For additional information please visit our new website at www.panconresources.com and our Twitter feed: @PanconResources.